Wish your favorite car could be part of your dorm room decor? It totally can! Our Ford Shelby GT500 Supersnake College Poster isn't just any old car poster. You already know it features the Ford Shelby GT500 Supersnake and that it looks pretty cool. However, this college poster is entirely in black and white. The grayscale effect of this photo makes this college poster one of kind. And one of a kind dorm essentials are exactly what you want in your college wall decor. After all, you don't want your dorm necessities to be and look like everyone else's and with this college supplies item, they won't! Our Ford Shelby GT500 Supersnake College Poster has a haze of smoke around the back of the car for a really neat looking effect in this college supplies item. Your dorm room decor is all about making your dorm room a cool, comfortable place. You want to look forward to relaxing and studying in your dorm room after class. 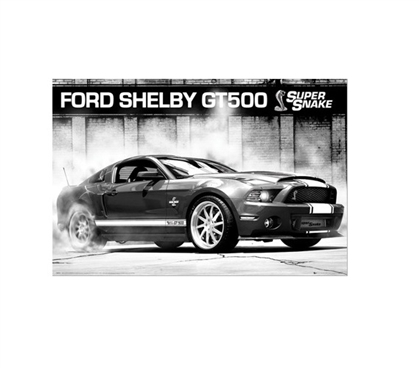 What better way to make your college dorm room a super cool place to hang out with friends than by adding dorm wall art of your favorite car to your college supplies with our Ford Shelby GT500 Supersnake College Poster!